The 503, 504, 505 and 506 Series thermal straps incorporate a single or double row of our OFHC UltraFlex™ cabling, and a single or dual L-fittings. As with all standard strap models, all 503 - 506 series straps come in P5, P6, and P7 models (in 2.0, 1.0, and 0.5 inch widths), are length-customizable at no charge (with optional bolt pattern), and most orders are shipped in just 4-6 weeks. 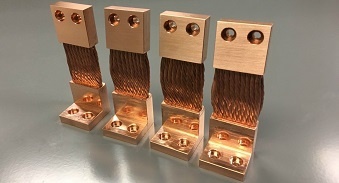 Please note that double row straps can become somewhat stiff at a rope/braid length (RL/BL) of < 2.0" (though still far more flexible than stacked metallic foil straps), so certain applications requiring a great deal of flexibility/compliance may require a longer outer row, or even a custom solution. We also would recommend that customers use our OFHC UltraFlex™ material instead of our TAI standard braid when possible. To learn more about the 503 - 506 product line (specs, dimensions and other information), download a copy of our new 2018 CuTS® Catalog (using the form to your left). Request your copy of the 2018 CuTS® Catalog! ***Complete drawings, details and specs on all of our standard models can be found in the new 2018 CuTS® Catalog. To see flexibility demonstrations of our standard and custom CuTS®, click here now!